Black and whitle photo reproduction featuring the interlinked hands and forearms of a male-female couple. The man’s forearm clearly shows "track marks" from injection drug use. Caption to right of photo connects IV drug use and the risk of AIDS and lists options for prevention. Picture caption: "Anna está saliendo con un chico que se inyecta drogas. Ella cometiende un error grave. El puede adquirir el SIDA por compartir el agujas de las jeringas. Ana podría contraer el SIDA de él. Ella tiene varias opciones: Hacer él deje de inyecta drogas o buscarle ayuda profesionel y tratamiento contra las dogas; o olvidarse de él, o por lo menos asegurarse que cuando tienen relaciones sexuales, él use un condón." 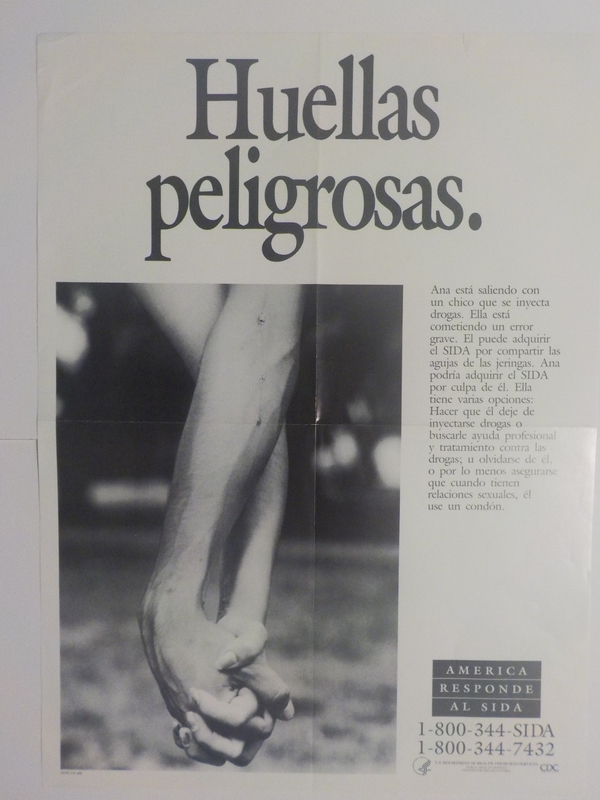 Spanish image of holding hands. Arms with track marks. Black & white photo. Yellowing. "A blurred photograph suggests that drugs and alcohol can cloud a young person's thinking and increase the risk of contracing HIV." - CDC National AIDS Clearinghouse, Catalog of HIV and AIDS education and prevention materials September 1994, p. 32, Order number: P150. National Institute for Occupational Safety and Health. Division of Safety Research.. National Institute for Occupational Safety and Health. Education and Information Division..
United States. Agency for Toxic Substances and Disease Registry. Division of Toxicology and Health Human Sciences.